Our motto, ‘Treating you well’, is not just a badge but a way of thinking - and something that we do our best to put into practice each day at Southern Cross Hospitals, with our patients, the medical professionals we work with and our own people. 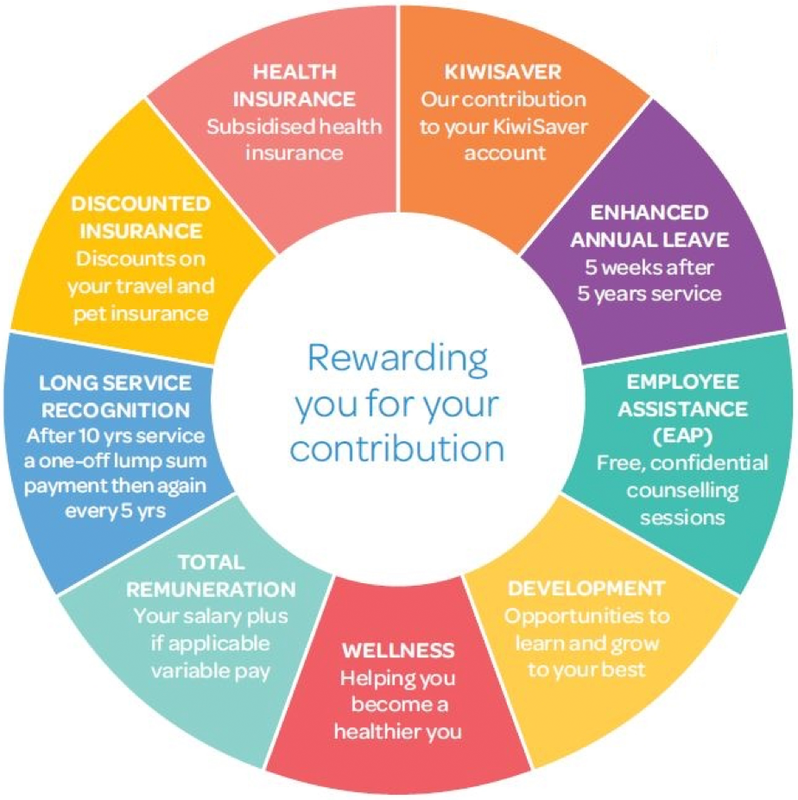 As you’d expect from a leading healthcare brand, we have a great range of employee benefits on offer, including everything from KiwiSaver and long service recognition through health insurance subsidies to professional education and wellness support. Treating you well is more than a by-line for us. It’s something that we all try to put into practice every day at Southern Cross Hospitals. It is relevant to staff and our patients alike, and reflects our partnership approach. Above all else, we want to look after our people. We make sure that we give you the right tools and resources to help maintain a positive work-life balance. Every employee is responsible for doing his or her job safely, and Southern Cross Hospitals is responsible for providing appropriate workplaces, equipment and training. We provide mandatory safety training and courses addressing areas including manual handling, working with machinery, energy and hazardous materials and emergency preparedness. We combine fun, healthy activities, informative presentations on healthy lifestyle options, and online resources. We promote and support selected employee-driven activities, and local team-based fundraisers and sporting challenges. Our employees have access to an Employee Assistance Programme (EAP), free flu jabs, nutrition information and more. This all adds up to a package that supports our people to be successful and creates a safe and positive working environment. Our work environment is family-friendly. Christmas and new year brings a welcome break with friends and family for our hospital teams. In some circumstances, we can accommodate employees who want to expand their professional horizons, and contribute to humanitarian and medical missions. And we are happy to discuss study relief, and our employees’ participation in some professional forums working to improve the qualityof patient care in New Zealand.